PLAYING MANTIS items hit the stores with a BANG! The PLAYING MANTIS PVC figurine collection from their "Memory Lane" series are finally here and well worth the wait! Packaged in a variety of ways, you can now find them in SUNCOAST, SAM GOODY, MEDIA PLAY and ON-CUE in very large and attractive boxed sets which are exclusive to those chains. The individually packaged figures and PVC clip-ons/keychains have already hit MEIJER stores! The first items to hit the stores included a seperately packaged ABOMINABLE SNOWMONSTER (or man) packaged with a header card on a large bubble pack for $10. He is loaded with hair and ready to put the star on the Christmas tree top. Then we have an action figure set in a box which is gameboard size for $19.99. These are basically the figures that came out at CVS as keychains last year BUT there are some GREAT New additions like King Moonracer, Charlie in the box and Santa beautifully sculpted by Tony Cipriano. 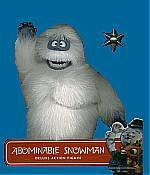 The combination of the PVC figures and the BUMBLE will appear elsewhere in a larger box set. There are two very large box sets which are SUNCOAST and the other stores mentioned EXCLUSIVES. One set includes Rudolph, Clarice and Santa with extras including Bunnies, Raccoons and a couple of misfits. Another set includes Sam, Hermey and Yukon with wonderful Accessories for those too! These sets are striking in the box and it would be a shame to take them out.....so, you may have to buy two! These are the sets that should have came out in 1964! "We worked hard to capture the characters the way that they appear in the special," says Playing Mantis' Creative Services Manager , Bob Plant. "Very close attention was paid to the likenesses and the color of every last detail." FROSTY is now appearing at SEARS PORTRAIT STUDIO! Commercials are running on the networks and kid's are now getting their pictures made with the RANKIN/BASS FROSTY THE SNOWMAN at SEARS PORTRAIT STUDIO in every mall! The art being used for this promotion was expertly done at WARNER BROTHERS CONSUMER PRODUCTS by Mike Fonta-Nelli (Pencils) and Patrick Owsley (Ink). They have lighted sign displays and a Christmas card set in a wonderful counter display. The Christmas Card sets sell for $5.99. You slip a small wallet size photo into a Christmas Card that has a FROSTY face image to the left. There are basically two pieces of art being used at SEARS. One is a wonderful FROSTY standing next to the NORTH POLE sign and another is FROSTY holding his broom! Don't miss it! MENARD'S Home Improvement stores are carrying the FROSTY THE SNOWMAN ornaments by ENESCO (Originally thought to be CANADIAN only releases) along with the ENESCO RUDOLPH THE RED-NOSED REINDEER ornaments which were EXCLUSIVE to CVS Pharmacies last year. The RUDOLPH ornaments are in a similar packaging minus the text giving the RANKIN/BASS history. The FROSTY line features six different ornaments in the set: 1. Karen 2. Professor Hinkle 3. Traffic Cop blowing whistle 4. Frosty with Christmas packages 5. Frosty Belly Whopping 6. Frosty marching with his broom MENARD'S is a mid-west based Home improvement chain and has the ornaments on sale for $3.99 until November 12th. The regular price is $4.99. The FROSTY line is perfectly sculpted and the BEST versions of the characters to date! The RUDOLPH DVD is a bonafide hit! Everything looks GREAT including a perfectly re-mastered "Fame and Fortune." Pick up the NEW DVD quick!